For the past 3 years I’ve used the color teal in every single quilt I’ve made. Probably aqua too. It’s not a bad thing…just a random fact I realized today while putting some quilts away. Maybe I should branch out and ditch the blues? This quilt was made to travel to shops for trunk shows with the Dixie fabric…and as soon as it was done it shipped out to hang in a shop. Trish saved the day and pieced this quilt for me this Spring while I was massively pregnant, and Melissa quilted it. The pattern is Dottie (here in PDF or here in paper format), the fabric is Dixie (you can use either a layer cake or fat quarters, I used fat quarters). You can find a kit for this Dottie quilt in Dixie here (they also have a Basket Case kit), and you can also find a Skipping Squares in Dixie kit here that is super cute. Dixie fabric can also be purchased here, or maybe even at your local quilt shop! I’m with you! Why sew a backing when you can use one big cut of fabric…..
NO…don’t ditch the aqau or blues. I love them! 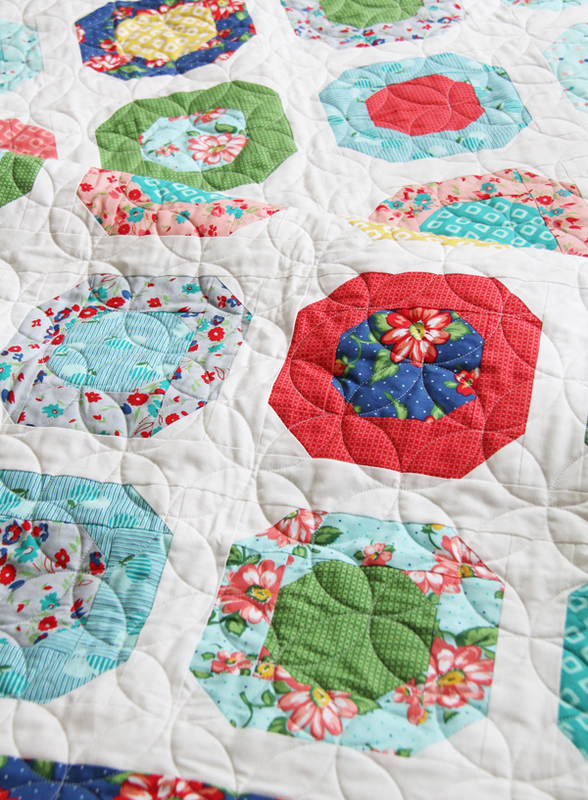 Quilt backings annoy me too! Dixie is pretty – colors and designs. Love, love, love! And I’m with you on the blues – they belong everywhere in my house! 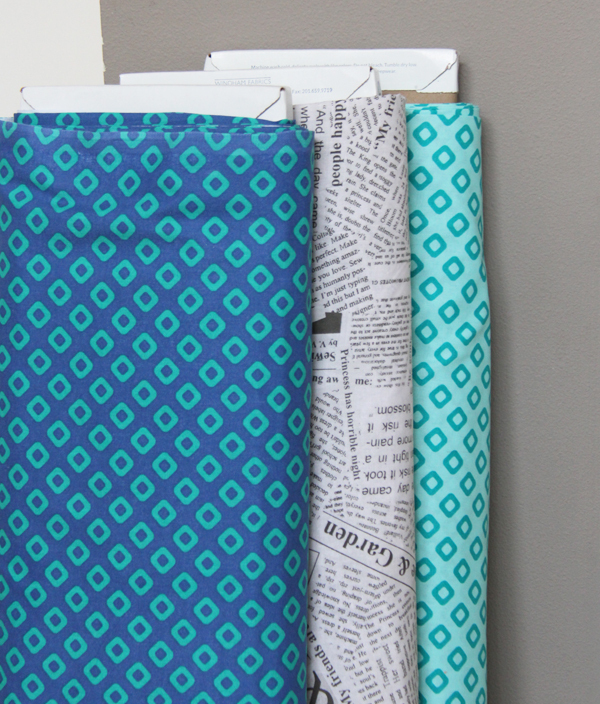 Oh LOVE your new fabric line with the Dottie pattern. 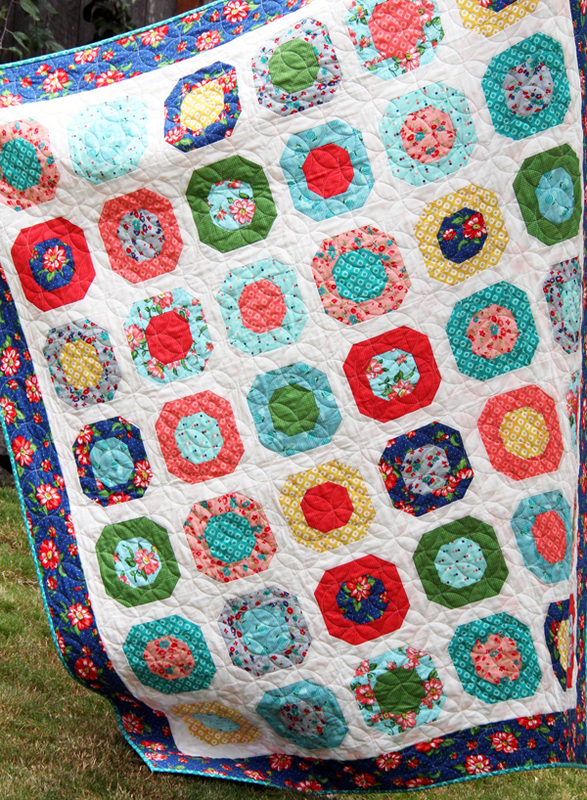 I have so many of your patterns that I still want to make – Dottie is one of them. Thank you showing it in your new line!! Do.not.get.rid.of.your.blues. in your fabric lines :)! Love it! The quilt and the fabric. I have noticed I use red in every quilt and don’t plan on stopping anytime soon either. And I will always use a 108″ backing if I can find one if I am not doing something cute on a back, which I do love doing. Love that added surprise when it’s turned over! Never stop using your blue hues! 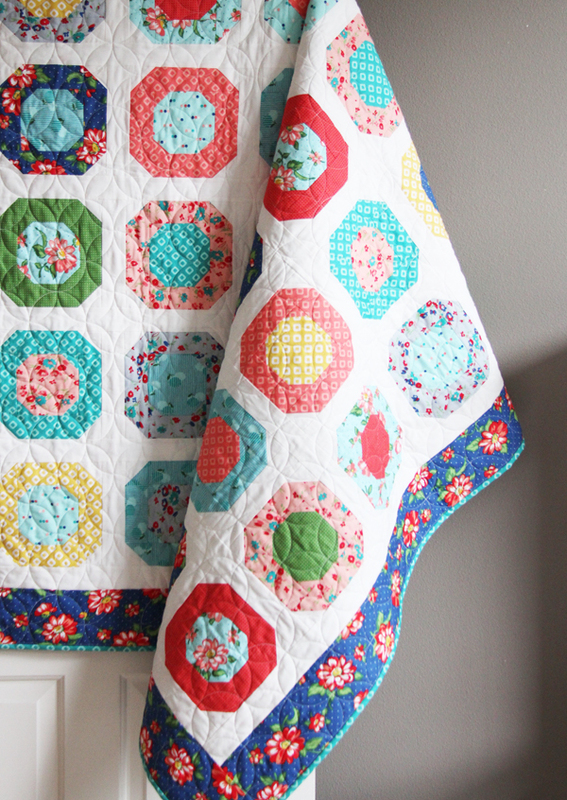 Such a cute quilt – and I love a good 108″ backing! Yes, the aqua and teal really set off the other colors. Love them. And the newsprint backing is awesome and so versatile — thanks for sharing the source! Your quilts in Dixie are so beautiful!!! I’m excited about the wide fabrics! I love that quilt. I also love those large backing fabrics. Do you know or can recommend any other manufacturers that make them or places where they can be bought? Thanks. This is very pretty. Love the design and fabric! 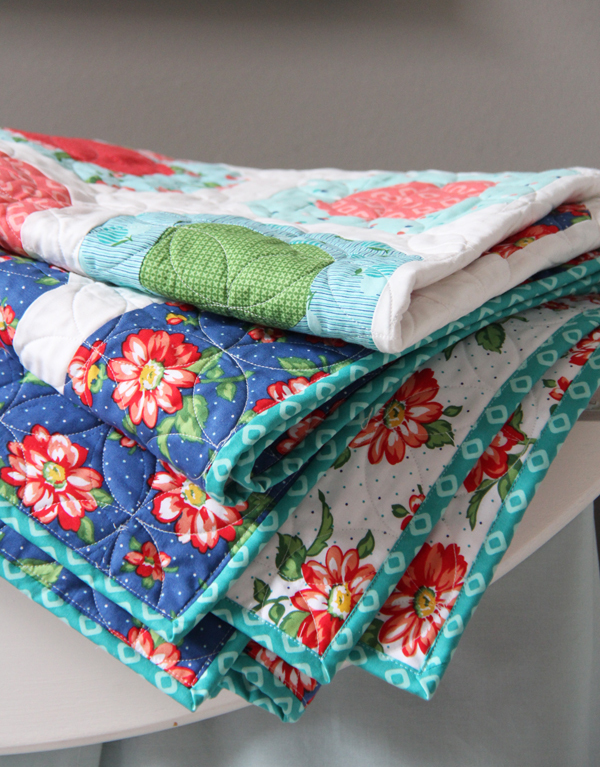 Love your fabric and the quilt (and the blue too) – How do you find the time with a new baby? Thanks for sharing and now, I need to make a longer to-do list! Luckily Jane takes long naps and likes to hang out with me in the sewing room! Do you know if the quilt kit for Dixie from Hancocks of Paducah includes the pattern? I sure don’t need anymore kits but I sure like this pattern and fabric line. I’m sure it does Mary Ann, if it doesn’t let me know and I’ll send you one…but I’ve never seen a quilt kit that didn’t come with the pattern. Thanks! Love teal and aqua. Find myself using it more and more all the time. I love your quilt. I also love teal and aqua. You gotta do what you love! I was forced to buy more Dixie from FQS after they sent my box last month. I love your fabric and have begun to hoard it. Must make all the things in Dixie!